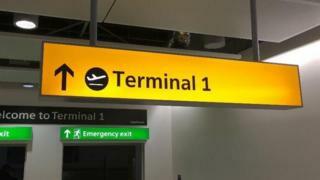 Baggage carousels and check-in desks are going under the hammer as the entire contents of Heathrow Airport's Terminal 1 are sold. Security scanners from the terminal, which was closed down in 2015, are also being auctioned off. Other things up for grabs include 15 escalators, 1950s artwork and more than 2,000 security cameras. Auction firm CA Global Partners hopes to fetch a six-figure sum when the items are sold on April 21. Daniel Gray, from CA Global Partners, said "a sale comprising the entire contents and infrastructure of an entire major airport terminal is unprecedented". He said art by Stefan Knapp and "iconic" signage would attract collectors, while the various chairs on offer might appeal to bars and nightclubs.